Fair warning: This report stays true to Mindi style and is very, very long! Proceed with caution and only if you have a few minutes to spare. 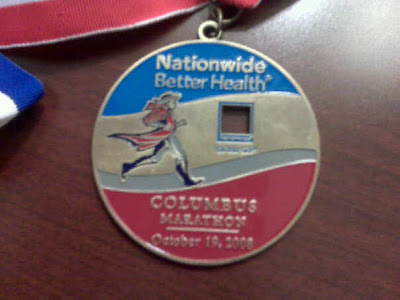 The Columbus Marathon was my second marathon of 2008. In May, I ran the Madison Marathon on something of a whim, with very little organized training and one 20 mile run. I ran a 3:46 and realized, HEY! I CAN do this while working long hours and still be a good mom and wife. And in fact, on some level, I felt that I really needed to fit it in for my own happiness/sanity. So I picked the Columbus marathon and wrote a schedule based on Pfitzinger’s 18 week/ up to 55 miles per week program. I was most concerned about the mid week medium long runs, but before I knew it, I was used to rising at 5:00 am or just before to log the miles. My training was slow and my heart rate was high, but for the most part I kept to my schedule and logged the miles. Typically I find Pfitz’s tapers to be aggressive – i.e. not enough rest. This time around, I felt pretty much fine throughout all of the training. I had a few minor injuries, but never felt overtrained or near my breaking point. I usually get sick during those last couple of taper weeks, so it was nothing short of miraculous that I didn’t this time. My entire family was sick and I had been consistently getting 1.5-2 hours less sleep every night for the last nine months. But, no need to question it, I’ll take it!! Leading up to Columbus, the weather looked perfect. Awesome. There is nothing worse than being 100% on race day to have mother nature throw a wrench in things. Now, it was all me. John and I left on Saturday morning at 8:00 am and dropped our boys off at my sister’s. We then hit the highway for Columbus. My first mistake was not printing out detailed directions. We let my Garmin Nuvi lead us. We were on 290 in Chicago and all of a sudden I saw 294 pass – oh no! We were headed straight into downtown Chicago. NEVER do that. But we did. And then we drove into downtown Gary, Indiana. Our exit (of course) was completely closed down and we drove all over the place to finally get to where we needed to. Then we hit some major construction and were at a complete stand still. Oh no…. what if we do not make it to the expo before 7? Fortunately we made it through and arrived in Columbus at 5:30 pm. We went to the expo picked up my bib # and chip. John wanted to get me a shirt that said “Marathon Ho” (well honey, this is marathon #7 for you….). 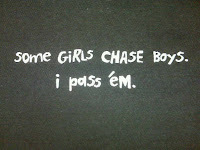 We settled on “Some girls chase boys, I pass them.” I also picked up an awesome Brooks nightlife wind breaker. With all my early morning runs in the dark, it seemed like a good investment. I wanted to stop somewhere to find a banana. My traditional pre-race meal is a banana, a bagel and Gatorade. No such luck in downtown Columbus. We then looked for a place to grab dinner. Salty recommended Martines, but it looked fancier than we were dressed and wasn’t really close to our hotel. Everywhere else we went either had ridiculous lines, or over-priced foods with lots of heavy sauces. Finally we stopped at the Elevator Brewery. They had a couple pasta dishes with heavy sauces. I asked for a chicken pasta dish without sauce. Um, well, no “sauce” per se, but it was SPICY! Yikes. Hopefully that will not cause any problems. John had a couple beers while I downed water. 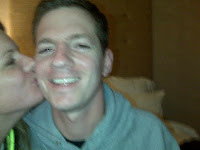 I’m not the most exciting date the night before a marathon! I hit the sack around 9:00 pm and actually slept pretty well. My alarm went off at 4:30 am. Yep, I was still on Central time and it felt like 3:30. I went over to grab my breakfast and DAMMIT! I left my bagels in the car, which was in some valet parking lot. Of course the hotel did not serve breakfast until 6. So I rifled through my running bag and found an old Clif bar.... Best if consumed prior to 1/07/2007. Not cool. BUT, it was the only option before me so I ate the nasty thing while I wished I had a banana. The rest of the morning had one little thing after another go wrong and I started to get rattled about it. My stomach was not cooperating, so once again I rifled through my bag and was pleased to find an immodium. Yep, it had expired over a year ago as well. At that point, I couldn’t help but laugh. What a ridiculous morning. Having a crap attitude was not going to help. Time to regroup. I told John – “You know, I am an old dog and you can kick me, but I’m not going down today! !” And so it was. I went outside to line up at 7:15. The beauty of the Columbus Marathon is that is starts right outside of the hotel so no long waiting. Perfect. It was dark and cold and I was PUMPED up. I absolutely love the pre-race vibe. The girl next to me was running the half. Her sister was running the full and going for sub-3 - she was hoping to be in for money. I wished her luck. The gun went off and I quickly tried to move over to the far right side of the crowd to see John. A few blocks up I did and high fived him. Before I knew it, I checked the Garmin and saw that I was at a 7:40 pace. Yikes, slow down. The first couple of miles were great. I was listening to a couple of guys talking smack. One of the guys made fun of his friend (and everyone else) that grabbed water at the first water stop. Rookie. Needless to say by mile 5 he was slowing and calling his friend a Kenyan. The first 10K of the race is either pancake flat or slightly downhill. Very fast. Very nice. Mile 7 had a few hills and I found myself stuck behind the 3:40 group. As usual, the Clif Pace Group went out WAY fast. A first time marathoner asked me if I knew what group was ahead of us. I told her it was 3:40 and asked her if she was hoping to qualify. She said she didn’t know. I told her to ignore them and to run her own race – they were way too fast and were banking a few minutes. I suggested she take it easy and pick it up at 15 if she felt good. She seemed relieved and backed off. I hope she had a great race. We started running into big crowds and I hoped I would not miss John since I was behind this huge group. All of a sudden I saw him, so I backtracked, grabbed him and passed off my jacket and gloves to him. It was awesome to see him and his new spectator friends. They yelled “Way to go Mindi” and I smiled. I kept going and wondered if I was running too fast. My Garmin was showing an 8:05 pace, so I figured I was probably around 8:10. I felt good, but knew that could change. I kept getting a short, sharp pain in my L ribs. PLEASE DO NOT TURN INTO A STITCH. I thought of Salty last year at Columbus…. Miraculously, it never did. The course was beautiful and continued to be fast. I saw John just before the half again and tried to give him a smooch on the run. It didn’t work, but we both laughed and I was thankful to see him. The half marathoners turned a corner to finish and I was happy that the races finally split. Now I could see who my competition was! I hit the half at 1:47:4x. Cool. I can hit 3:35 if I do not bomb. The next miles were pretty uneventful. The course was nice and I had to focus on not dropping pace during these miles (although I did a little anyway). Around 15 I started to pick it up and felt good. We ran past the Ohio State stadium and it was very quiet. I passed a few people and was glad I felt good. Mile 17 was tough – a few bigger hills and it forced me to concentrate. Negative splits. We went through the OSU campus and I kept thinking how unattractive the campus was for such a big school and a beautiful city. I had read that the course would go past frat row, but did not see any enthusiastic students. I guess the marathon was not advertised well. No one even offered me a beer. Not that I would take one today, but come on! I hit mile 20 and saw I was at 2:50 or something (according to the course clock). It seemed impossible I could hit 3:35 now. But then I remembered I am completely incapable of math after 15 miles and to just go. So I did. At around 22 miles I started getting tired. Then I thought, I only have about 30 minutes left. This is 30 minutes of my life I will never get back, how will I spend it? So I dug deep and decided I would make myself proud. It was a solid decision. Miles 23-24 were hilly and a bit tougher. Nothing insane by any stretch, but also a far cry from the super fast first half. I hung in there and kept looking for John. At mile 25 I picked it up a bit, or at least I felt like I did. I saw John (after hearing him him screaming his head off at me) just before the turn to the finish. I smiled at him big and turned on the afterburners. The finish is down a big hill – so I screamed on down and hit the last .2 at a 6:15 pace. Nice. 3:34:20. Expectations exceeded. We rushed back to the hotel and I quickly showered before our noon checkout. We stopped at a Ruby Tuesday outside of town and I indulged in a big fat amber beer. MMMM. Delicious. So naturally, the question is, what’s next? I have some girl friends trying to talk me into Boston 09. We will see. For now I am taking the week off and enjoying crappy food and lots of fermented beverages. I laugh as I write this because I feel long-winded. But it is oh so abbreviated compared to the experience. A good thing. Fantastic. Isn't it funny how you have the least to say about the races that go right? I felt good at the half, ran even splits, got tired at the end, then I was done. The start line right outside the hotel sounds like a dream come true. No long lines at the porta pottie? Walk out the lobby and start the race? I want that! Sorry we missed on this Ohio trip. What a fabulous race for you. Congrats!!! Other than the pre-race food/tummy issues, sounds like it was a great day.